Enjoy a day on the links with fellow ECU supporters for a game of golf and plenty of prizes! With trophies awarded to the teams with the lowest gross score and lowest net score, longest drive, and closest-to-the-pin, your swing may land you a bounty. Best of all, it’s for a good cause—ECU scholarships! Since its establishment in 2005, the ECU Alumni Association scholarship program has awarded 297 scholarships totaling over $432,000. These scholarships are funded by contributions from generous alumni, along with participants of the golf tournament in the fall and the Pirate Alumni Road Race and Fun Run in the spring. * Your participation in these fundraisers ensure the continuation and growth of our scholarship program. *Proceeds fund annual scholarships with any balance supporting the scholarship program. No refunds will be issued after 9/1/18. 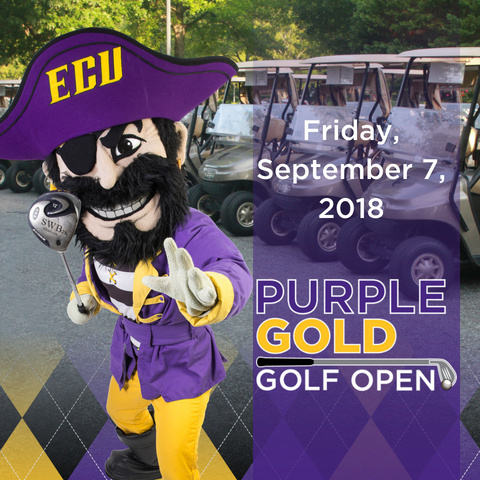 Player package includes breakfast provided by Chick-fil-A, lunch provided by Outback Steakhouse, snacks and Pirate beverages, green fees, cart fee, and complementary ECU Alumni gift bag. Raffle tickets are available for purchase online and the day of.